Is it possible to set up a better engineering system for aircraft so when you order aircraft and they arrive you can effectively pre schedule their C&D checks? - I dont know- maybe have like a slot system similar to what you have for ordering new aircraft but where you can allocate your aircraft for C or D Check maintance allowing the scheduling sytem to run like a diary for the duration of the game. This will then allow you to schedule new aircraft as they arrive at your base to pre-schedule it for engineering at a future date. I find the current system frustrating when your running a large fleet and if you can preschedule it - I'm sure life would be alot easier. I propose a maintenance calendar. I'd still like to be able to schedule an a/c (of the same type) to cover the routes of the a/c's in c & d check (along with the proposed maintenance calendar). Maybe this a/c could be let out as a charter plane when not busy or give it secondary priority routes when it isn't covering maintenance. Im just talking about getting the aircraft in C/D Check to start off with - I have 170 odd aircraft currently with about another 100 arriving and its messy - but if you have a diary typoe system where you can allocate each fleet type to certain days/weeks/months then it surely will make things better and then you can have some spare charter aircraft to take the slack especially when dreaded D check time arrive and an a/c is out for a quarter of the year! I have been thinking of the calendar idea for MONTHS now. I was just to lazy to explain my idea. 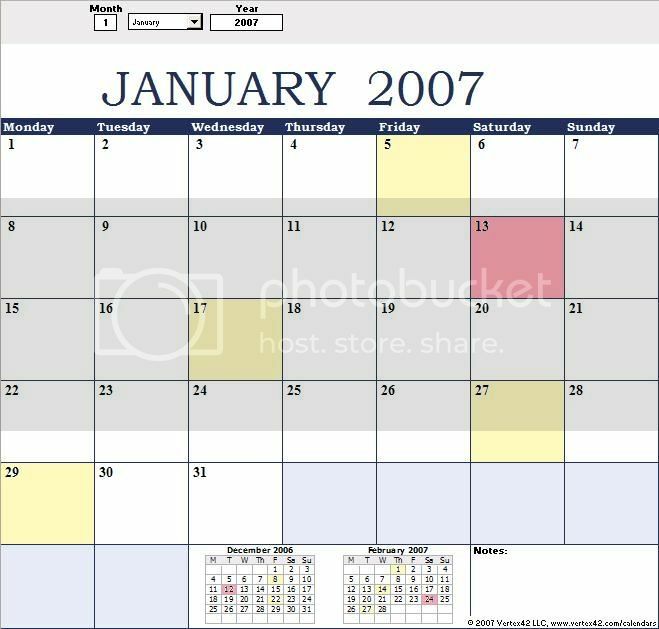 The calendar would be like a regular one except that the boxes with a C or D check would be filled with a color. Yellow for C, and red for D. If there is a C and D check on the same day, the box would be half yellow and half red. You can hover over the boxes to see which airplane will go into maintenance. The checks are automatically put on the calendar as soon as an a/c arrives. You may wish to change the date but only earlier. I don't feel like explaining anymore so I'll let you guys elaborate. I like the idea of scheduling C checks, no matter how it is arrived at. Thats Exactly the type of thing I was thinking! Additionally I think it would be more practical to show about 3, 4 months or more at once, possibly with weekly frequency, showing the duration of the checks, not only the starting point. This will allow one to see a "gant chart" type view which will improve the visual interpretation of the checks/events. (Not unlike the scheduling page view). Sami, what do you think about this? It's a great idea, but you can plan your C checks by doing them earlier and in that way change the date of it. One hangar = one aircraft in maintenance at the same time. oooooh.. now THAT is a cool idea. In this master calendar, the tail numbers scheduled for maintenance on a specific day would be listed in that day's square, with colored text or icons indicating which type of maintenance is being performed on each. Absolutely outstanding! Great suggestions by everyone. I agree with this. I like to lease an aicraft to cover my c/d checks, and its hard to always be at the computer to swap aircraft around so youre schedule is not in limbo while an aircraft is in maintenance! I think this is a very useful feature but it was never given a hyphen or "ok". A visual representation of when our a/c are going into maintenance would be very helpful in the game. I agree i have been thinking about something like this as well lately. would make it a lot easier to build and enact a mtce sked when your working or sleeping. A nice feature would also be to have stand-by aircrafts that will automaticly "jump in" during checks, making routes beeing flown even tough the aircraft which normally operates the route is at maintenence. ^^ Would love to see the above idea implemented. I am keeping a C-Check spare for each aircraft type in operation but have to manually cycle through the schedules each time. Requires constant attention! would be nice if an aircraft could be marked as "Maintenance Spare" and used to cycle the C/D Checks.